I think if scientists spent sometime with traditional medicine, we would advance further than we think possible.I couldn't agree with you more on this! thanks for posting your research on cassia!!! fascinating! 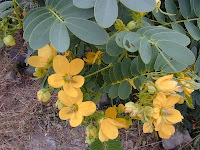 i noticed the same thing about the different types of cassia as i did some research (it wasn't this much-lol). but the literature wasn't as convincing as henna. the antibacterial/antifungal properties were promising so i thought about using it instead of henna for a while since i didn't want henna to alter my color too much. but i also want to know if it binds to hair. oooo, this is so interesting!!! i hope i have the right brand! i'm going to go look and see if i have the one that helps. i got it from mehandi.com, a pretty reputable site. so hopefully they gave me the right one. You're so right. There are so many herbal properties that are being thought from generation to generation and it seem like they are not fonding much researches to confirm this knowledges or bust the myth. How come coconut oil has being proven beneficial only recently ? Thanks for reminding me Kadiane! this is awesome info -- i followed you from bglh and i will be subscribing!! Thanks Lina - BGLH is fab!